All galvanized materials for long lasting durability. All panels are pre-assembled. Kennels can be custom built to size. Please allow one week for completion. HEAVY DUTY WELDED STEEL KENNEL - The Lucky Dog complete box kennel is perfect for residential or professional use. Steel bars and wire mesh are welded before coating to prevent sharp edges that may harm your pet and offers greater rust and corrosion protection. 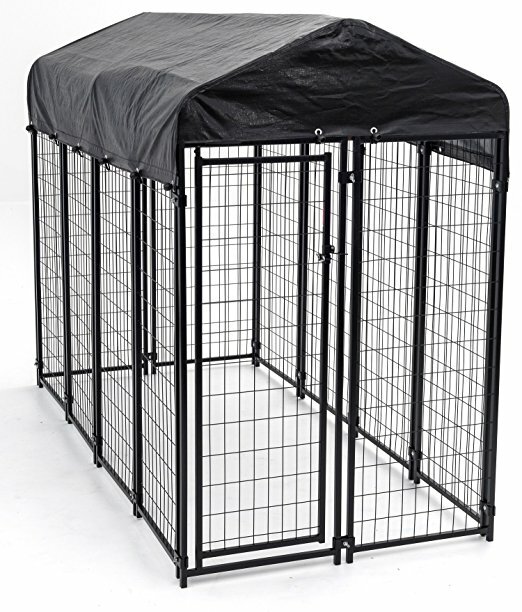 WATERPROOF COVER INCLUDED - The heavy duty waterproof cover and steel roof frame fit the outdoor cage perfectly and the enclosed ends provide your pet with full protection from sun, rain, snow and debris. Added UV protection prevents ripping, cracking, fading or peeling giving you years of worry-free use. Sturdy elastic cords won't break or stretch and hold the cover securely for a snug fit. The roof pitch allows for water, debris and light snow to run off instead of accumulating on the roof.